Gulf Restoration Network is an 18-year-old nonprofit focused on clean water for the Gulf Coast. Our first issue was around the dead zone in the Gulf of Mexico, which is due to a lot of the nitrogen pollution from up the Mississippi River. We believe that clean water builds healthy wetlands and healthy wetlands are the nursery that makes abundant Gulf fisheries. The Gulf of Mexico is made fertile by the Mississippi River Delta, but it all comes back to abundant, clean water flowing out of the Mississippi River. I’m the Coastal Wetlands Specialist within GRN, which means that I know a lot about wetlands and I use that knowledge to review wetlands permits under the federal Clean Water Act. While the law says that you have to avoid destruction, sometimes our regulators are not so enthusiastic— the regulatory agencies will refer to people who apply to destroy wetlands as their “customers”. They communicate pride in serving their “customers” very quickly and expediently. I think that our job as environmental advocates is to really make sure that they’re doing their due diligence and enforcing the law. We used to have a lot more wetlands in front of the city, and it is the lack of those wetlands that allowed New Orleans to flood in 2005. We no longer have land in front of the city to absorb the wave impact from tropical storms. This is not only a concern for New Orleans, but for our entire region, which is a unique geological landform in the world; there are many other deltas, but nowhere else in the world do you have a powerful river like the Mississippi that empties into such a gentle bay. And that’s how we get these barrier islands. That’s a good segue. Can you talk about the importance of the barrier islands? And can you clarify what you mean by “gentle bay”? Gentle bay meaning a calm sea or a large body of water that’s not an ocean, in this case the Gulf. The Nile entering into the Mediterranean is the closest analog that we have, but it isn’t as steep, not as powerful and doesn’t drain as big a watershed. With the Mississippi, there’s a lot of water coming relatively quickly with lots of sediment, and it enters into this very gentle sea. The river built the land that New Orleans sits upon because the river dominates the geological process, rather than the tide or ocean waves. When you look at a map of the southeastern portion of Louisiana, you’re looking at land that’s entirely built by a “delta switching” process— the Mississippi is constantly moving back and forth, and wherever it moves it builds land. You’re looking at several different lobes, some of which are older than others. In what we call the St. Bernard Delta is the delta lobe that built the Chandeleur Islands; it’s the oldest lobe. There’s a large amount of distance between the barrier island and the marshes behind it. When you look at Grand Isle, Port Fourchon, that is a much younger lobe, so there we have marshes that still connect to the barrier islands. The youngest lobe is where the current river is, which is called the Birdfoot Delta, and there the islands are only starting to build. The Gulf is rising because of climate change, so the river is slowing down and when the river slows down that sand drops out and starts to form islands. It’s only in the past decade that we’ve begun to see real proto-barrier islands form on the Birdfoot and the river is backing up and it kind of wants to make another switch. The River will flow down the steepest path it can find to the Gulf, and as one way becomes flatter, islands form, the water backs up, which causes flooding and possibly a new, steeper route to the Gulf. The barrier islands are part of a natural, integrated coast that protects New Orleans from hurricanes. That coast has been degraded so that it no longer protects us as it should, so our organization as well as many others are advocating to rebuild an integrated ecological system— not only for flood protection, but because this is a tremendously productive estuary and a one-of-a-kind ecological engine. Louisiana is still, even though it’s a degraded system, it’s still the second largest producer of seafood in the United States. We often hear from the Dutch, which have a similar situation of being below sea level, about a certain strategy that involves a lot of walls and gates. Certainly, we’re learning a lot from the Dutch here in New Orleans, but our strategy is of a different character because their walls and gates have killed their estuary to a large degree. What we’re looking to do in Louisiana is unique and unprecedented. It’s to use the river, which is a great engine, to build land and wetlands that will restore our flood protection and to integrate that natural flood protection with engineered walls and levees. What are some of the biggest obstacles that you see to restoring wetlands? Is it primarily natural or are there also man-made components to it? It’s difficult— I guess the biggest obstacle is the money. 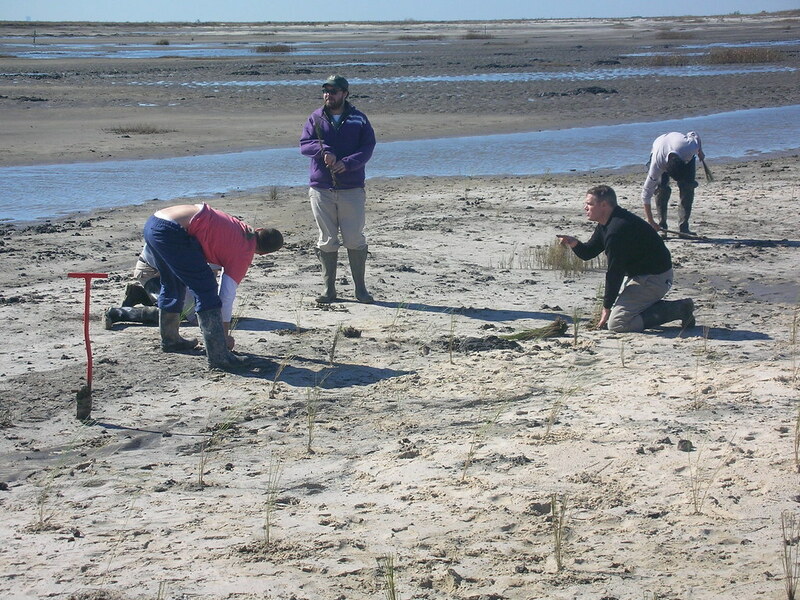 We’ve been restoring wetlands in Louisiana since the coastal crisis was recognized as a problem in the 90s. But we haven’t really had the money to do it at a scale that will actually replace enough wetlands to restore the flood protections. So I think the silver lining of the BP disaster is that we’ve had plan after plan after plan, and finally this may bring the money will scale with our ideas for what needs to happen to restore this ecosystem. Can you focus a bit on the Chandeleurs? It’s the eldest of the island systems, so in some sense, it’s the closest to becoming a shoal. A shoal is still a big mound of sand, just under the water. It still protects New Orleans even if it is a shoal, but it no longer provides habitat for birds like pelicans. That’s a natural process, it normally takes thousands of years, but we in the United States have accelerated that process by making the Louisiana and Gulf such an industrial area. When you say barrier islands, people imagine an island that acts like a wall, but that’s really not the kind of protective function that it has. The protective function of barrier islands is really more on a daily basis. As the tide comes in, the tide goes out, the islands keep a lot of the saltwater from coming in, and they provide volume that fills the tidal prism— that’s kind of a difficult concept. If you want to conserve water in your home, you put a brick in your toilet tank so that there’s less water that flushes through your toilet. Well, the barrier islands and marshes as well as oyster reefs and other aspects of wetland restoration are all filling that tidal prism so that there’s less day-to-day erosion of the waters that come in and out. And they all work together, so if you just rebuilt the barrier islands and didn’t rebuild the marshes behind them you’d still have so much water flowing past the islands that they’d erode really quickly, but if you didn’t rebuild the barrier islands and you just rebuilt marshes, these marshes would be exposed to the daily tidal forces that would erode them and they would disintegrate more quickly. What makes the Chandeleur Islands very ecologically special, to me as a fish ecologist, is that they are the only known place in the Gulf of Mexico where we know that Lemon sharks pup. We don’t know a lot about how sharks have babies, but we know that these islands are a very important place for this shark, which is a threatened species. We don’t know a lot about how they reproduce, but we do see the baby sharks, we see them when they still have their umbilical scars, so we know that they’ve been born in the past half hour. And the babies use the shallow waters of the islands and the sheltered seagrass beds behind the islands, as habitat in order to grow up to be healthy and happy sharks. Was there an effect on the islands because of the spill? And going forward long-term is it going to have an impact? Oh, yes, tremendously. And this is a system that is already disintegrating… we’re losing a football field of wetlands an hour. The Chandeleurs were already in a very bad way— they were already very disintegrated. It used to be one island, now it’s an island chain, It was formally made a park by Theodore Roosevelt, back when it had more trees for roosting and nesting. It was one of the very first national parks in the United States because Roosevelt loved the pelicans that raised their babies there. Well, that oil is very toxic and very harmful to those mangrove trees that allow the pelicans to roost, but the roots of the mangroves are also keeping the sand in place. So the actual island starts to melt away when the oil kills those mangrove roots. And normally oil floats and it hangs out on the surface, but the dispersant makes the oil hang lower in the water column, so the sea grass beds which are important for the sharks are affected by the oil. I think a lot of people are very sad about the situation with the Chandeleur islands. It’s a bad situation and that’s part of why we need these BP monies, to dredge sand to be placed on the island to build it back up so that these habitats can be restored. Can you talk a bit about the importance of restoring wetlands in Louisiana? This place that has been beaten down and degraded is a jewel of an ecosystem for the entire continent of North America. The Mississippi River Delta is an important flyway for migratory birds, so if you’re a fan of ducks in Canada, you need the Mississippi River Delta. Louisiana has the second largest fishery in the United States because that delta is a tremendously productive estuary, but the wetlands also play a critical role in our flood protection strategy. It’s important to restore marshes and we’ve been doing that in a small way by mechanically dredging sediment, making a hold, piling the sand up to what’s called marsh level, a level that the marsh plants colonize it rapidly. But we’ve been doing this in a small way and we’ve been doing it artificially with dredges and pumps. That works, but its expensive and it won’t last. In order to make the wetlands last, we have to reconnect the river with the estuary because that river was the original ecological engine that built the land. So we need to combine those approaches, have the short-term fix of dredging sediments to build marshes, and then we can sustain these marshes if we allow the river to flood them regularly in a controlled way. That’s called a river diversion, or a river reintroduction. Combining both at the short- and long-term approach is important in order for us to have a productive ecosystem as well as to have enough land that will protect New Orleans and infrastructure from storms. Can you explain a bit about why wetlands are important for hurricane protection? Yeah, wetlands soak up water, their organic soils are basically big sponges. A lot of the land in Louisiana is made up of plants, there’s no rocks in Louisiana. The plant roots themselves are very important for knitting the land together, as well as absorbing not only the daily wave energy of the tides, but the larger wave energies from storms. So its all about the roots. The roots not only anchor the ground in place and keep the storm surge from reaching the city, but they also anchor the ecosystem ‘cause the plants are what provide shelter for all the shellfish and larger fishes that we eat and sell commercially. Here in Louisiana we are very accustomed to being called a “sacrifice zone” or a “playground for industry”. Do you have any thoughts on how industry effects restoration efforts in the wetlands or barrier islands? I talked about delta switching which is how some of the wetlands in Louisiana would have degraded naturally, but that process is thousands of years long. Industry accelerated that process by dredging lots of canals and extracting oil and water from under the marshes, making them sink— and the companies refuse to acknowledge this. The oil industry really needs to do a hell of a lot more, they destroyed over 400,000 acres of wetlands in Louisiana. They do little projects here and there, but they need to step up and repair wetlands, especially in Terrebonne Parish. They could very easily fund a sediment pipeline from the Atchafalaya River to Terrebonne Parish to build wetlands in front of those communities to protect them from storms. Although we have laws regulating wetlands destruction, often those laws are not well enforced, to say the least. Which is a shame, because it’s the natural environment that keeps us here. In no place in the United States are people more dependent on the natural environment and healthy plants. New Jersey has its meadowlands, but New Jersey isn’t dependent on the meadowlands growing healthily. Here in Louisiana, if our plants are sick and dying from oil waste, then we lose our food source, our culture. As we lose our wetlands, we lose our basic shelter, our storm protection. And that’s kind of where we are. People in Louisiana have been concerned about the degradation of the ecosystem for 20 years. So there’s a whole generation older than me that has been advocating for this kind of wetlands restoration for a while. My elders, they have said when Katrina struck that if we don’t really scale up and do large scale wetlands restoration within 10 years, it might be too late. So that was 7 years ago. If we don’t get started very soon, it might be too late. But if we get started soon, and there happen to be a lot of stars that are aligning… it’s a desperate situation to be sure, but we have the Louisiana Master Plan which puts the river back into the estuary in an aggressive and coordinated manner with levee protection, we have the RESTORE Act that’s going through the United States congress that will divert funds against BP to wetland restoration, so that brings the money to finally scale up to these plans that we have to rebuild wetlands. We’re thinking that the silver lining of one of the worst oil disasters in the history of the world, might, if the company is penalized appropriately, bring the fines to scale up restoration so that we can have something good; we can realize our strategy of combining wetlands with levees for flood protection. It has a chance to work, if we start it right away with a lot of money, billions of which will come from the BP fines, and more of which needs to come from the oil industry.